I bought the kids a Karuma PlayBase for Christmas. I need to root it so I can limit ads that pop up inside a some of the free games and the resulting angst and worry of my better half of what may come up. 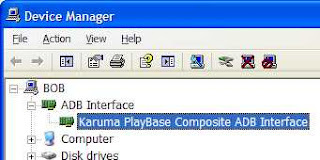 Unfortunately, Karuma's online presence (and user community) is pretty non-existant. Added 3-31-12: It looks like the PB is already rooted (# command prompt in the ADB terminal instead of a $). Now I just have to figure out how to get into recovery mode so I can get an updated su and superuser on it. The chip is made by Rockchip- it's an RK2918.